"The story of how James Cook charted Aotearoa New Zealand, lavishly produced and richly illustrated. Since it was published by the Admiralty in 1816, James Cook's chart of New Zealand has long been regarded as one of the most extraordinary achievements in the history of cartograp... read full description below. The story of how James Cook charted Aotearoa New Zealand, lavishly produced and richly illustrated Since it was published by the Admiralty in 1816, James Cook's chart of New Zealand has long been regarded as one of the most extraordinary achievements in the history of cartography. 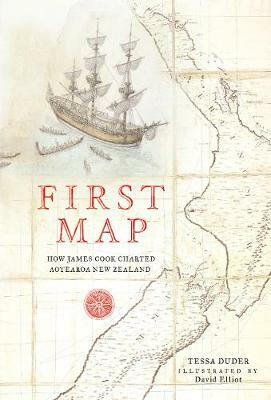 First Map: How James Cook Charted Aotearoa New Zealand tells the human story behind the creation of Cook's famous chart, following the progress of his six-month circumnavigation of New Zealand and piecing the map together as the narrative on H.M.B. Endeavour unfolds. It is a story of courage, dogged perseverance and Cook's extraordinary skills as both cartographer and seafarer. Scenes from Tessa Duder's evocative text are beautifully recreated by award-winning illustrator David Elliot in this exquisite large format edition. Published to coincide with the Tuia - Encounters 250 commemoration of James Cook's 1769-70 journey around New Zealand.